Mackenzie Gray is a Canadian film, television, and stage actor. 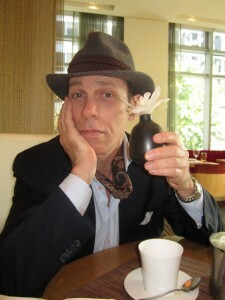 I chatted with Mackenzie Gray over a wonderful brunch at Market by Jean-Georges in the Shangri-La Hotel Vancouver. A professional actor for over 30 years, he has worked on stage numerous times in Britain, Canada and the United States. He has also appeared in over 130 films and television shows and was a series lead on a major US network. Gray has also done voiceover work for animated series, documentaries and video games. In addition to performing, Gray is a director, writer and producer in film and theatre. He wrote vignettes and “shorts” for several episodes of “Sesame Street” from 1984 to 1986. Gray also has a musical background. He was the lead singer and rhythm guitarist of the Toronto rock band The Fridge Stickers. Mackenzie has composed and recorded many songs, incidental music and scores for films, TV shows and web features. In 2008, he co-produced the award winning feature film Poe: Last Days of The Raven. He taught Film History at The Art Institute of Vancouver for 5 years and teaches Acting for Film at The University of British Columbia. Mackenzie has worked on stage in Canada, Britain and in the United States in hundreds of plays, musicals and cabarets. He was most recently seen onstage as Steve in the Pulitzer Prize-winning August: Osage County at The Stanley Theatre in Vancouver, and as the “Foreman” in the Snickers commercial featured during SuperBowl XLV. In addition, he played several roles in the Tom Waits/William S. Burroughs award-winning hit rock opera The Black Rider, in Toronto and Vancouver. What were your most recent films? Alcatraz (produced by JJ Abrams) that was filmed in Vancouver. Sitting in cafes having cups of tea and watching people go by while reading the newspapers. I also play guitar with a band “rekkerz” for fun at Wreck Beach in the summer. Yes, at 5 years old my parents played me “Camelot” and I always wanted to recite. I performed plays throughout school. In high school I formed my own theatre group –writing my own material, doing plays in Toronto (Jarvis collegiate), creative friends who are musicians (also went to art school in my teens), after high school I went straight to London moving there at 18. All of my heroes were British Actors and I loved London. That is where I went to get trained in those days. I did Theatre first and acted on stage for 4 years. I went back to Toronto to the U of T for 4 years and trained as an actor, designer and director. I Graduated in 1983 and landed a role in “Summer Folk” the biggest show in Toronto. From Toronto I was doing theatre, film and television. Then I did an audition film for a production in Vancouver, the whole process was crazy, but the agents in Vancouver loved it and they booked me for 13 episodes to start, playing Greg Harney the hitman. 1st class ticket to Vancouver, $5,000 signing balance, $17,500 per week. The Net (based on Sandra Bullock) that`s what brought him to Vancouver. He was set up with a Vancouver agent sharing him with his Toronto agent. Fresh peaches and strawberries, lamb, sole and asparagus. Which restaurant are you looking forward to dining at next? Where was your most recent trip? What do you think is missing in Vancouver specifically in the arts community? Any advice for local actors? Don’t let the people who say it is tough and don’t do it – Learn, listen and just do it and you can get anywhere. Don’t drink the kool-aid. Vancouver is the easiest place in the country to make it. Work about developing technique and craft that will support your art. Networking and branding are good things to know but are in definition of being an actor. What else are you working on currently? I am also producing and directing and re-writing a play called “Math our Loud” which will be shown in schools on a tour. The characters are in a dream, are confused about math, guided by a wizard of odds. If you were offered a play in NY or London would you do it? What are your favourite places to hangout in Vancouver? What are your favourite restaurants in that past that are no longer?